Intertrigo is a common skin disease that primarily affects young children and older adults of all races across the world. Read on to know what is Intertrigo and also learn about its causes, symptoms, diagnosis, remedies and treatment. It is an inflammatory skin condition that causes swelling of the skin folds, or the warm, moist regions of the human body where two skin surfaces press or rub against each other. The ICD9 Code for this disease is 695.89. The condition is most commonly found to affect infants, elderly individuals and people who find it difficult to move due to obesity or a severe health condition. It may also afflict individuals who are bed-ridden or who wear supportive devices such as braces, splints and artificial limbs. These equipments press against the skin and trap moisture, which leads to this skin problem. Typically, this condition may affect any region of the body where the skin traps moisture or where two skin surfaces rub against each other. This disease mostly affects the uppermost layer of the skin, making the afflicted patches change color and turn pink or brown. If there is high moistness, the skin may decompose and collapse. In acute cases, the affected regions may emit a foul odor. Impacted skin patches are frequently found to be extremely raw. The skin flecks may itch, crack, ooze and even bleed. Most patients experience redness and irritation in the regions, which occur due to constant rubbing of two opposing skin areas against each other. Moisture and heat from sweat or other bodily fluids may rapidly worsen the problem, making the skin rupture (break open) and become vulnerable to infection. The condition also afflicts immunocompromised patients, bed-ridden people or individuals using artificial limbs or similar medical devices. 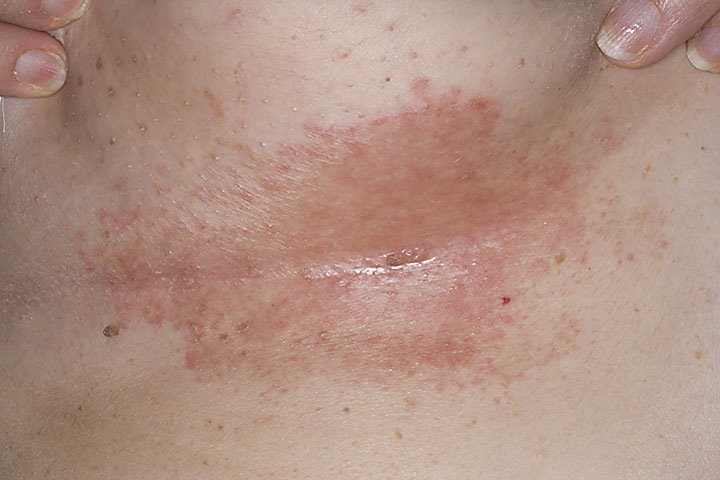 The disease leads to the development of red, scaly skin patches that may ooze or itch. Antibacterial soaps, topical Imidazoles, cotton fabric bands and absorbent body powders can help prevent occurrence or recurrence of this disorder. The problem mainly arises due to excess fat in the areas of the body where skin folds rub or press against each other. Constant friction between two skin folds irritates both surfaces. This promotes breakdown of the skin as well as other problems like inflammation and formation of rashes. Other than moisture, the disease is also supposed to be caused due to pathogens like fungus, yeast or bacteria in the folds of the skin. The condition is common in people residing in countries having warm, moist climatic conditions. Warm climate causes more sweat. Trapping and retention of sweat causes Intertrigo. The condition is often seen in babies having chubby necks. Very young babies or infants find it difficult to hold up their heads. This causes the skin folds of the neck to rub against each other. In many cases, the friction gives rise to painful rashes on the neck. The disease leads to the development of rashes on the neck as well as other regions, such as the nappy area and the underarm. In babies, skin areas affected by the disease should be gently cleaned and patted dry. While cleaning, parents or caregivers should not rub the area as it may cause further irritation. Anti-moisture creams can be effective in addressing the problem. Medicines are not recommended to be used without the consent of a doctor or any other experienced medical professional. Individuals suffering from diabetes or even cases of borderline elevation of blood sugar levels can be highly susceptible to Intertrigo, even though they may be perfectly healthy otherwise. This condition is found to arise as a common complication in diabetics. Medical researchers believe that diabetes causes poor blood circulation throughout the body. This makes the skin surface more fragile and vulnerable to inflammation and infections. Pregnant women are commonly found to suffer from this skin disorder. The problem is supposed to arise from the weight gain that occurs in women in labor. As the body puts on more weight, skin folds under breasts or between the thighs rub against each other. This causes irritation and gives rise to red, swollen blisters in the same regions. Women who sweat a lot are particularly susceptible to this disorder. The problem can be managed by keeping affected area as dry as possible. Talcum powders and moisture-absorbent substances should be applied over the skin for effective remedy. Wearing loose-fitting cotton clothes can also help natural escape of moisture from the body. No, this is a non-contagious condition. An affected person cannot pass it on to another non-suffering person. Healthy individuals are at no risk of suffering from this disorder. If the disease fails to resolve within two weeks even after home care, patients should contact a dermatologist or any other medical professional. Generally, simple physical examination of the affected skin areas should be enough to diagnose the condition. Special tests are not necessary. However, a doctor may chose to evaluate a skin sample or culture from the affected fold to detect any secondary infections. Laboratory testing of skin samples may help detect the presence of fungi or bacteria and allow doctors to make an accurate diagnosis. KOH examination, to rule out a fungal infection. A Wood’s lamp test, to detect a bacterial infection known as Erythrasma. A skin biopsy may be required only in rare cases. Mild cases of this disease can be generally cured at home by properly cleaning and air drying the affected areas of the skin. Infants and adults suffering from incontinency (inability to hold urine or feces for long periods) should be frequently monitored to prevent further moisture accumulation in their body. Adults having this disease should wear loose-fitting clothes to avoid friction and irritation of the skin folds. Obese individuals are urged to lose weight, so as to lower chances of skin friction. Paralyzed or bedridden patients should be frequently monitored to ensure that rashes on their body go away. Compress the affected skin surface with wet tea bags, dilute vinegar or Burow solution 1:40. This can yield effective results, particularly if followed by cool blow-drying or fanning. Using antimycotic agents like Clotrimazole or Miconazole can be quite helpful, particularly if used for a short duration along with a class III- VI steroid. It is best to use mild or mid-strength topical steroids and not those of stronger potency. This is because the occlusive effect of the skin folds can quicken the development of striae and skin atrophy. Castellani paint or carbol-fuchsin paint may also produce effective results in curing the skin problem. Acute cases of Intertrigo are usually treated by a course of antifungal or antibacterial drugs. Anti- inflammatory medicines are also to reduce discomforting symptoms, such as pain and inflammation. Grifulvin V and Griseofulvin are two of the most commonly prescribed medicines for this disorder. It should be noted that while antiperspirants are a good way of getting rid of sweat, they should not be directly applied over skin folds affected by Intertrigo. This can give rise to pain, irritation or other discomforting symptoms. Long-term cure of this disease involves following preventive measures, which obliterate or at least reduce the risk of development of rashes in the future. Doctors and caregivers should provide patients with useful information to avoid recurrence of this condition. Losing weight and keeping the body moving can often help. Keeping areas of folded skin open with dry towels or blowing a fan across moist areas can also help. Wear loose clothing. With therapy, the outcome is excellent for each case of simple Intertrigo. However, recurrence of this condition is common. In paralyzed or disabled individuals, healthcare providers can prevent occurrence or recurrence of this disorder by helping them change their postures frequently. Frequent bathing on a regular basis can prevent buildup of sweat in the body and avoid possibilities of reappearance of future rashes. Loose linen or cotton clothes can help avoid friction of skin folds and also trap sweat between the skin surface and cloth. It is best to wear garments created with absorbent fabrics like cotton. Garments made of nylon or other manmade (synthetic) fibers should be avoided. Wearing moisture-soaking undergarments and well-supported bra may also be helpful. Loose-fitted garments can also expose skin folds to the air. It is advisable not to wear tight shoes or belts that may chafe the skin and trap sweat for a long time. Constant friction will result in skin irritation and give rise to red rashes. Obese individuals are particularly at risk. It is essential to keep skin cool and dry, so as to prevent heat and sweat buildup. It can also eliminate chances of cracking of skin. This can be done by frequent bathing, using air conditioning and applying sweat absorbent powders. Overweight individuals should try to lose weight with regular exercise. A regular workout regimen can reduce body weight and also improve metabolism. However, it is important to shower and dry off completely after exercising. Using a hair dryer can dry and cool the areas of the body that can trap sweat and prevent escape of moisture, such as the groin, armpit or under the breasts. Here are some Intertrigo images that will show you the physical appearance of skin regions affected by this condition Check out these Intertrigo photos for some authentic visual idea about the disorder. Get in touch with your health care provider if the disease persists in spite of proper home care. Treatment is also necessary if you find the condition spreading outside an affected skin fold. Timely diagnosis and cure of the disorder will help you get relief from discomforting symptoms and make a faster recovery.